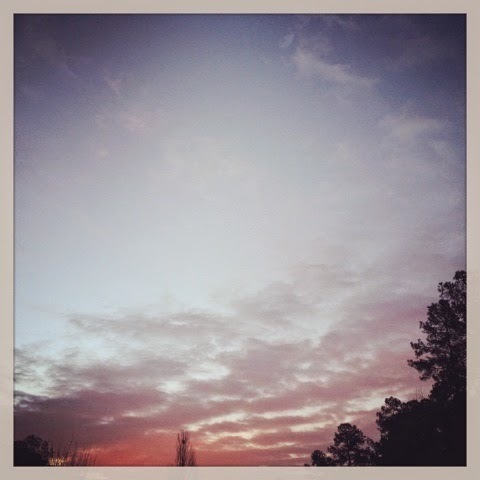 Yesterday dawned all pink and white and ethereal. We had snow on the ground and snow clouds in the sky. The morning light was diffuse and rosy, and just like in the old rhyme, "Red sky in morning, sailors take warning," a big storm was coming. I couldn't capture the beauty of the white snowy landscape and white sky bathed in red dawn light on my cell phone. I wish I could have, because in the evening it started to snow again and now everything looks totally different. Giant golf ball sized snow flakes, my favorite kind of snow and so rare here, were fluttering down by 8 last night. I still have a cough and aching ears so I couldn't walk in it but just made a quick trip down to the corner and back with my husband. This morning we woke to a pristine, snow-blanketed world. We were lucky, only getting about 2 of the 6 inches forecast. The areas of the state with more had widespread power outages. I took a short walk in the snow with my husband last night because I knew I wouldn't see him for a while. We've hardly seen him at all since Valentine's Day. All this weather means he's been going into work at 3 or 4 AM and staying late. He's worked for the power company since before we were married, so I'm used to him being away during any kind of bad weather. Snow and ice storms, hurricanes, wind, even extreme hot or cold days, I know I'll be on my own. I've done it alone and with brand new babies and even once when a fallen tree barely missed the house, (and when another one didn't miss the shed) and I know I can handle it. I can always use a little help, though. Today, despite still having a bit of lingering illness, I decided to get out of the house and shovel the driveway and walk. My daughter caught the cold after I did and has been out of school, between snow and illness, for two straight weeks. My other kids have hardly gone any more than she has, and everyone is getting stir-crazy. I've been shoveling snow and ice quite a bit lately, and it takes a toll on my skin. Recently someone asked if the scent of my nail cream from the New Year Nails post could be used in a lotion, so I've been experimenting with that, and I think I've got it. My cold-exposed, snowed-on skin could use a boost right about now! Mix well and store in a glass jar. Apply liberally at night or when you will not be exposed to sunlight, as the citrus in the lime oil will make your skin sensitive to sunlight. 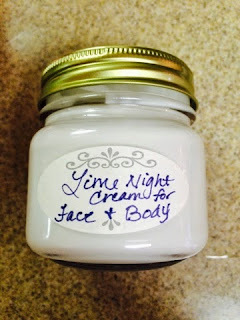 Oil blend for nighttime skin care, pain relief, and strong nails. 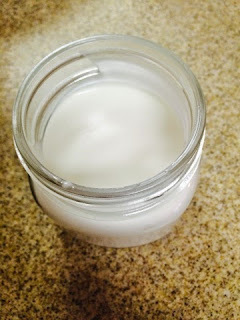 Even though this is exactly the same oil blend as the nail oil it still has lots of great benefits for skin. Aside from headaches and muscle pain, the blend of oils in PanAway and Valor may help fade bruises. Valor also may help remove scars. Lime is a citrus oil, so it exfoliates the surface of your skin, revealing a brighter complexion, and also helps fade broken capillaries, works as an astringent to tighten pores, and may reduce cellulite. All these oils have soothing properties as well. Lime helps with stress and mood, Valor is often recommended for tooth grinding, and PanAway relaxes muscles with menthol. I've even seen Valor recommended for bed-wetting (but haven't tried it so don't know if it works), so this makes a great night cream for many reasons! The blend works fabulously as a nail oil too. I just made my second jar of nail and cuticle oil and my nails are getting long and strong again. As soon as I have time to give myself a manicure I will post an updated photo of my hands. (As always, remember Young Living products and my recipes are not FDA evaluated and not intended to substitute for medical care). Here's where to order the Young Living oils used in this post. The only change I would make with this cream is to choose a different base lotion. I bought a knock-off generic version of Nivea and it's super-runny even without the added oils. I know a lot of people in my oils group use Cetaphil as a base cream but I wonder if that wouldn't have the same texture. I think next time I will buy pure Vitamin E cream to use as a base. It doesn't have a strong scent and it's thicker, like body butter. 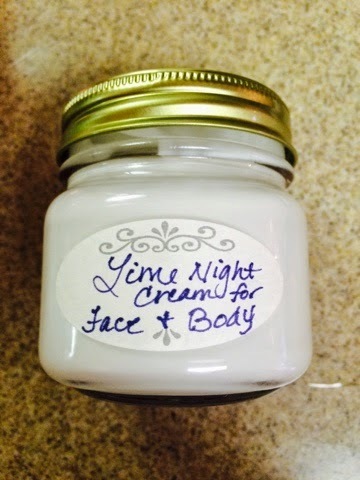 The cream I made is really more like a light lotion. It would be good in a pump bottle if you can find a glass one. Citrus oils degrade plastic and cause chemicals to leach into the product stored inside, so you definitely want a glass container. This does have the yummy lime scent I was trying for. I am in the process of cleaning my office and re-organizing all my fabrics, which is why I haven't posted much in the doll arena lately. I hope to finish soon and then you doll lovers will start seeing new posts again. Each month Young Living offers Essential Rewards promotions. If you spend a certain amount on your Essential Rewards order you get free stuff. Essential Rewards is a program for Premium members. You place an order of at least $50 each month (you can change the items you purchase every month) at the wholesale price, get reduced shipping rates, and earn points to use as product credit toward Young Living products; what's not to love? Then to earn free products on top of that is fantastic! 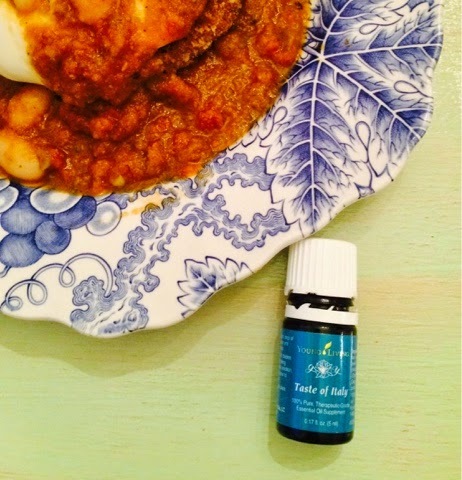 One of this month's promotions was a free bottle of the Taste of Italy essential oil blend. 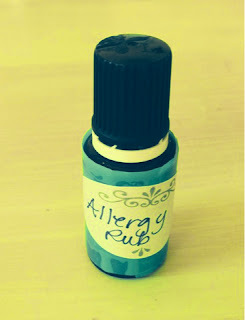 This is a combination of three types of oregano essential oil and basil essential oil. I was super-excited about this because we use a lot of Italian herbs. In fact, I've never been able to grow enough basil to get us through the winter. I grow organic herbs and freeze them in Ziploc bags. Once you've gotten used to fresh and frozen herbs you'll never go back to dried; they just don't have any flavor. We've been out of basil for months, so I was really happy to get my Taste of Italy. The essential oils have the same vibrant flavor as the fresh herbs and the little bottle certainly takes up less room than bags of frozen herbs. It's easier to use, too. Oregano and basil are really good for you. Oregano, in fact, has been shown in studies as a more effective antibiotic than penicillin, according to an article I read last year! It just happens I caught a terrible cold from my son the same day my Taste of Italy arrived, so I wanted to make sure I formulated some immunity-boosting recipes with it right away. Yesterday my husband used it in an "immunity bomb" smoothie. You can find that recipe on my Naturally Amanda Facebook page. Tonight I used the Taste of Italy in a yummy recipe I call "Veal Verde". 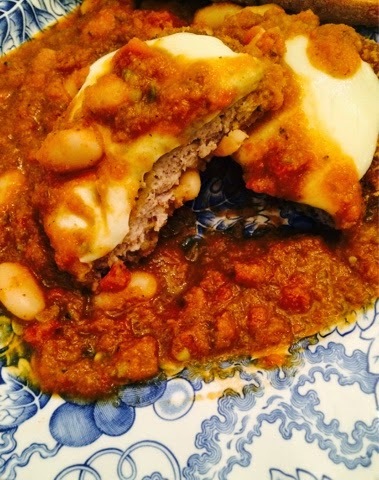 This take on Veal Parmigiana features beans and pureed vegetables rather than pasta and since I don't feel good, a "cheater" doctored-up canned sauce that tastes homemade without day-long simmering. The "verde" is for the extra nutrition boost provided by a pound of green and cruciferous vegetables hidden in the sauce. If you can't find veal patties breaded chicken patties will work just as well. Cook veal patties according to package directions, placing a mozzarella slice on top of each patty in the last 3-5 minutes of cooking so the cheese melts. Meanwhile, prepare sauce. Thaw and puree the Italian vegetables. Drain and rinse the beans. Combine the beans, the pureed vegetables, and the marinara sauce in a sauce pan and mix well. Add the wine, salt, and garlic powder. Bring to a boil, then reduce heat and simmer while the veal cooks, about 30 minutes. About two minutes before the veal is ready add the Taste of Italy oil to the sauce. Place a pool of sauce on each plate, top with a veal patty, and drizzle with more sauce. If desired, serve with Italian bread. While we don't usually eat processed food, I do keep some prepared foods on hand for busy nights or times I don't feel well enough to cook. 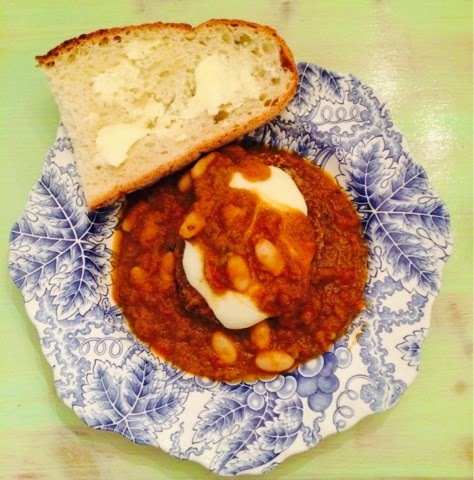 This meal is reasonably healthy and fast and easy to prepare. I usually make my own sugar-free marinara sauce and freeze it, but we're out right now. Of course, if you can devote a day to making a bunch of sauce you can freeze it so you have healthy and fast homemade meals on hand. As it turned out, Parmesan cheese would have been a better choice than the mozzarella, which was too chewy for those of us wearing braces. I'd be happy to help you order your own bottle of Taste of Italy or sign up for a Young Living wholesale membership and Essential Rewards. If you'd rather just try out your kit for a while without signing up for Essential Rewards that's totally understandable; just click "No Thanks" in the Essential Rewards section. You can sign up or cancel the Essential Rewards at any time. Contact me or use the link above. Sadly, this Valentine's Day was sort of a bust for us. Our son had a birthday party about 30 minutes away so we did at least go out to lunch while he attended. On the way back we stopped at a nursery where my husband bought me a Meyer Lemon tree just bursting with blossoms and already bearing one gigantic, softball-sized lemon bright as a tiny sun. Things went downhill after that, however. An epic windstorm blew until the small hours of the morning, so my husband, who manages the power grid, was on conference calls late into the night. Then he had to get up before dawn and go into work, where he remained for about 12 hours. We are expecting quite a bit of snow over the next few days, so he has a long week ahead of him. 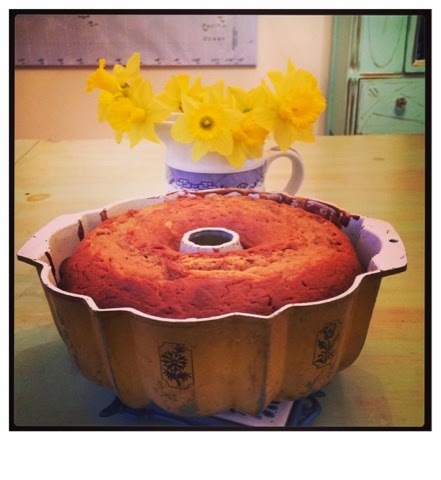 I decided, life having literally given us one lemon, to bake a lemon pound cake to cheer him up. 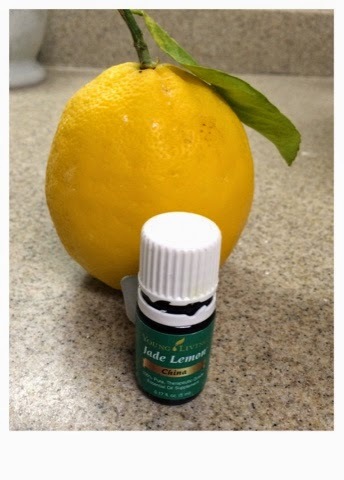 Jade Lemon essential oil adds extra flavor. 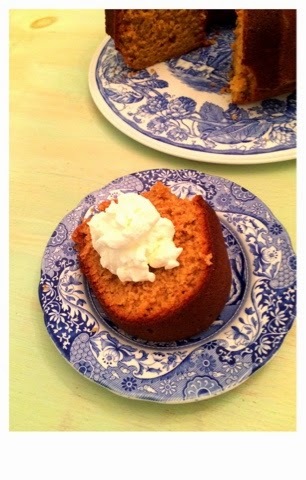 I found the recipe for the pound cake on Pinterest, pulled from the Plain Chicken blog and made a few adaptations. It was originally served at the Ritz-Carlton in the 1920s. 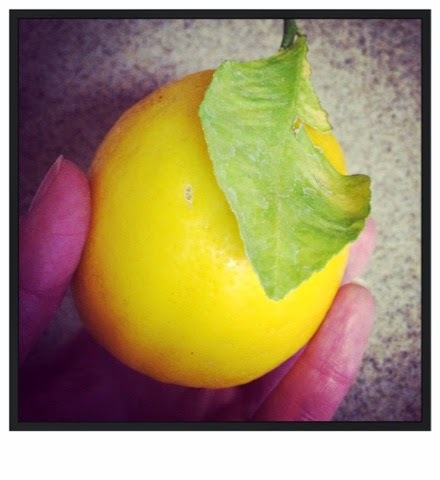 The recipe calls for 6 tablespoons of lemon juice. My lemon was huge and super-juicy, but still only yielded about 4 tablespoons. I added 1/2 teaspoon of Jade Lemon-infused olive oil to make up for the missing juice. Find the instructions for making infused oils here. This cake has a subtle lemon flavor, especially if your palate is used to fake lemon flavoring, so you could also just add 5 drops or so of Young Living lemon or jade lemon essential oil for a little extra intensity, or even replace the lemon juice and zest entirely by adding more oil. I would not recommend replacing all that liquid, however; this is a really unusually moist pound cake because of all the juice. Don't forget, although Young Living lemon essential oil is edible, most essential oils are not. You may contact me through this blog or through my Naturally Amanda Facebook page for Young Living lemon essential oil. Another adaptation I made to the original recipe was to use a coconut sugar blend. Coconut sugar doesn't raise blood glucose levels the way cane sugar does, so we often use it in place of cane sugar. Sally Fallon's books, like Eat Fat, Lose Fat, and Nourishing Traditions, contain lots of information about the science and studies showing the benefits of coconut sugar, among other foods, and I highly recommend them. 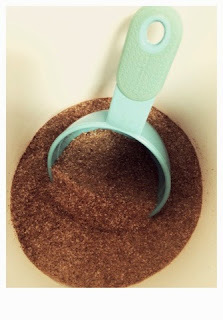 The blend shown above is about 90% coconut sugar with 10% raw, unrefined cane sugar. Coconut sugar is expensive so I cut it with a little unrefined cane sugar to save money. Something I have noticed about citrus fruits is they tend to cause me to get mouth sores if I combine them with cane sugar, but coconut sugar doesn't have that effect. I assume there must be a difference in acidity with coconut sugar. Coconut sugar provides a caramel flavor and darker color to baked goods. Mix flour, baking powder, and salt in separate bowl and set aside. Cream butter, lard, and sugar in a mixer until well blended. Use the butter wrappers to grease your Bundt cake pan and then lightly flour the inside of the pan. Add the eggs one at a time, beating after each addition. Add some of the flour mixture, alternating with milk and beating after each addition. Add the lemon juice, lemon zest, and lemon oil and mix in gently. Pour batter into your prepared Bundt pan and bake at 350 degrees 55-70* minutes or until a skewer poked into the cake comes out clean. Cool the cake in the pan for 15 minutes and then turn onto a rack to cool completely. Serve with whipped cream or lemon curd if desired. This batter is designed to fill a vintage Bundt pan, the kind made when the recipe was created. 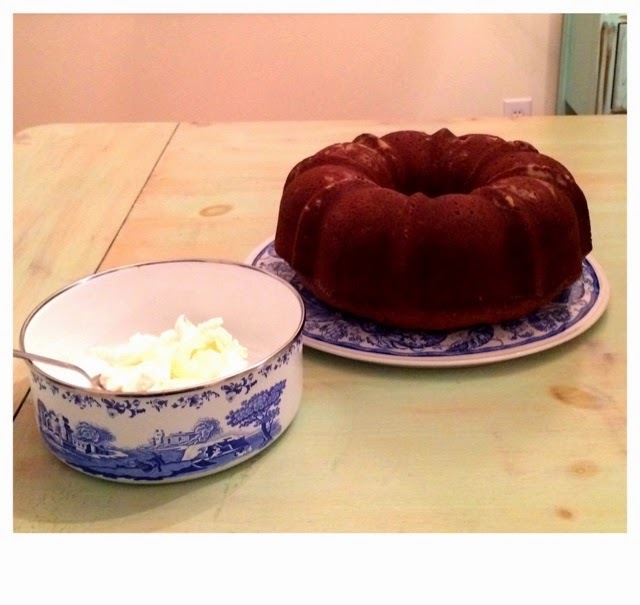 I use a vintage pan I found at a thrift store, but if you have a modern Bundt pan you will have leftover batter. *This cake is supposed to take only about 55 minutes, but at 40 minutes the sides and top of mine was getting too done and the center was still raw, so I had to make a tent of aluminum foil and keep checking it at 5 minute intervals. This, of course, made it take longer, around 70 minutes total. This is most likely due to my stupid oven. I hate, hate, hate, hate, HATE my oven. We went without a dishwasher for months because I wanted all new matching appliances. But at Christmas my husband decided to go get a fridge and dishwasher but no oven, so now we have mis-matched appliances. It drives me crazy every day and doesn't bother him at all. Even more annoying is that our oven doesn't work. It doesn't heat evenly and things are always getting burned on one side only, or just on the bottom, or top, or whatever. We have a gas stove top separate from the oven and inserted in the counter and I hate it too. The grates are absolutely impossible to clean. I have tried every cleaning fluid and implement I can imagine and they always look dirty. So anyway, I'm pretty sure it was just my oven but you might want to check your cake starting at about 40 minutes to make sure you don't need to tent it. You will also notice I use non-hydrogenated lard or coconut oil in place of vegetable shortening. Sally Fallon's books contain lots of reasons why these real fats are much healthier for you than lab-created shortening. 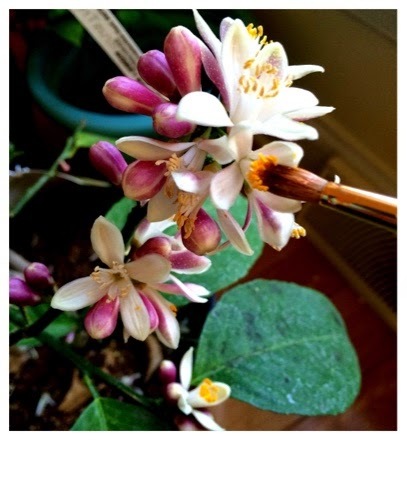 A couple weeks ago one of my Meyer Lemon trees had one blossom. These trees are not supposed to need another tree to act as a pollinator, but they are much more likely to bear fruit if you have two. 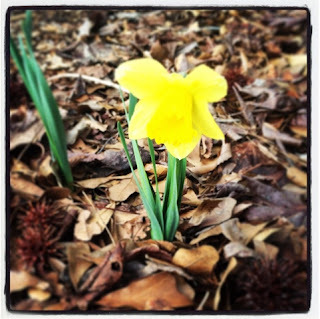 If I'd had more than one bloom I could have helped it along, but I didn't, and the flower fell off without bearing. The new lemon tree is absolutely covered with flowers. 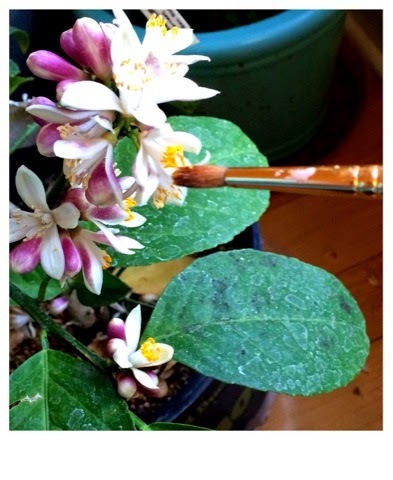 It's making the dining room smell fantastic. I definitely want more of these superior lemons, so I decided to perform some artificial lemon insemination. I just take a regular artist's paint brush and go all around the plant like a bee would, inserting my brush into each flower. You have to be gentle so you don't knock the flowers off, but over the years I've found this increases all my citrus yields. The other day I was out for my walk. It was an absolutely gorgeous day, but to tell the truth I wasn't really noticing. The sky was perfect cloudless, "China blue" as my mother always says, the lake was a deep rippled sapphire, but I was paying more attention to my feet and knees being sore, all the things I needed to check off my to-do list, negotiations over a large doll sale that weren't going well, and all the other minutia of daily life. I stood by the lake to take a little break (I'm 40 years old and right now I'm walking 5-8 miles a day and doing intense P90X 3 workouts 6 days a week, so I need a rest now and then!). As I stood there looking at the water it occurred to me how rarely I feel true happiness. Every so often I might get a little jolt of joy, but daily feelings of happiness or even contentment? Not so much. I decided try to focus more on just enjoying life. I'm not talking about being glad you made some money, or happy you lost weight or won a door prize; I'm talking about cultivating a pursuit of pure, unadulterated joy. Naturally, I turned to my essential oils for help. Take time to notice everyday beauty. If you think about it, an enormous amount of life goes on in your head. At least, that's how it is for me. In 1998 my husband was injured in a near-fatal accident. He was in the Surgical Intensive Care Unit of the hospital for several days and they had him on morphine. As I sat vigil next to his bed I was relieved whenever he fell asleep because the morphine turned him into someone else completely. The things he said to me were just awful and I left the room in tears several times. I was pregnant at the time, so I'm sure that had something to do with it, but it was as if the person who woke up after the accident wasn't my husband at all. After about a week they moved him to the orthopedic floor and removed his morphine drip and the transformation was immediate and amazing. Years later he was trying to quit smoking and I remarked to my mother that I could tell when he had a relapse because when he has nicotine in his system he acts like a colossal jerk. My mother said, "It makes you wonder how much of our personality is just the chemicals in our bodies at any given time." Indeed. I've never forgotten that. So maybe it is possible to manufacture happiness for yourself just through what you're putting in and on your body. As you know, I drink Young Living grapefruit and lemon oils in water daily to help with weight loss and to flush dangerous petro-chemicals and other persistent pollutants from my system. The other day I read an article about how lemon improves digestion by actually helping your body balance the amount of acid in your stomach and I have to say I have noticed an abatement of digestive issues since I started ingesting the oil. You could drink water with lemon to get this same effect; you'll just have to drink more of it and make sure you use organic and thoroughly washed lemons. Remember as well that most essential oils are not edible. Some Young Living oils are and dosages are noted on the label. And as always, remember Young Living products are not evaluated by the FDA and not a substitute for medical care. Once you've begun to rid your system of the toxic crud unfortunately present in our soil, water, air, and food you can introduce better stuff. I've been reading a lot about aromas and natural essences to improve mood and developed this "Love and Happiness" blend. The reason I include love is that I can't think of any time in my life personally when I've been happier than when I've been in love. The day you meet someone and feel a connection straight into your heart and soul, the day you first hold your child in your arms, the day someone smiles at you and you realize just being with that person, just walking around, lifts your spirits; that's where it's at! Somehow, though, I often end up focusing on my loved one's faults, my friends' lack of time, my childrens' poor grades or bad behavior and forget to really see them the way I did in that very first moment. So, while you can't depend on anyone else for your own happiness, focusing on the things you love about others can certainly improve your mood. Another thing that really improves my mood is living in a beautiful environment. Just walking into a clean and fragrant house will lift my spirits immensely. Cleanliness is short-lived around here, unfortunately, but fragrance I can do! 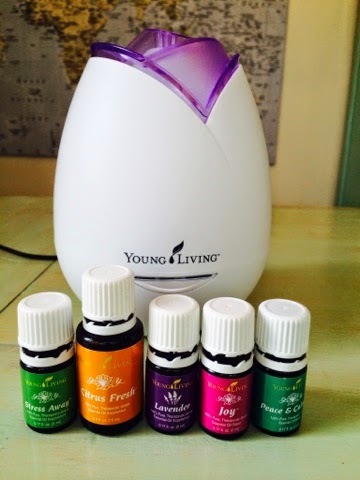 Place in a diffuser filled with water and run 30 minutes, three times per day. For added benefit make a steam tent by placing a towel over your head and the diffuser. Breathe in the mist and meditate on pleasant thoughts or pray. This blend boosts love and happiness for several reasons. The orange essential oil in the Citrus Fresh and the ylang ylang in the Joy and Peace and Calming blends are recognized natural aphrodisiacs for women. Lavender promotes relaxation, and the vanilla in Stress Away soothes and comforts. Tangerine and lime in the Citrus Fresh and Stress Away blends have uplifting properties. Because it's nearly Valentine's Day, I formulated the same blend into a massage oil which also functions as an aphrodisiac. Even if you aren't in a relationship or are away from your special someone on Valentine's Day, I recommend using this oil as a bath oil, moisturizer, or even as a perfume. It smells amazing, and after all, you have to love yourself first and foremost! Another great benefit of the Joy oil blend is that it tightens sagging skin. I found impressive before and after photos of this effect on Pinterest. 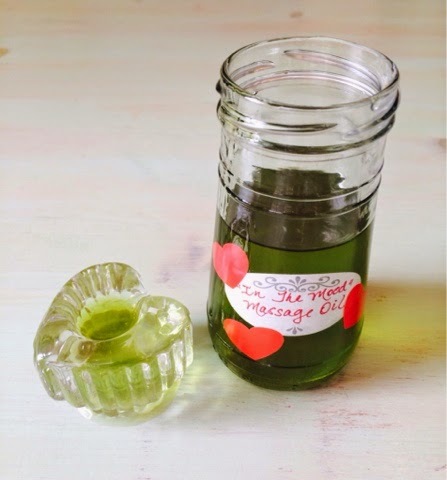 So this massage oil just might lift your rear as well as your mood! 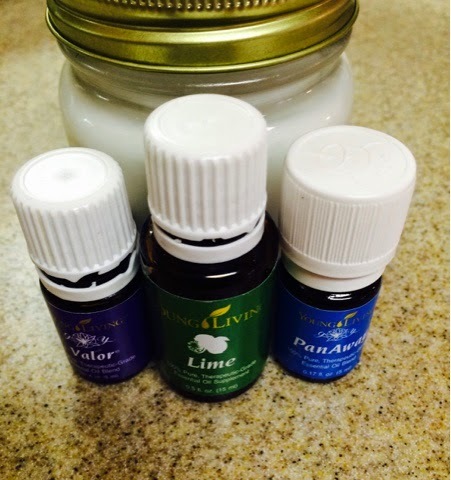 Mix all ingredients and store in a glass container. Massage on skin as desired. For added benefit, diffuse the Love and Happiness Diffuser blend while performing massages. I think I'm going to give myself an early Valentine by cleaning this house and diffusing some Love and Happiness! I've been working so hard lately, and that, along with my daughter's medical treatment for her corneal abrasion, have left the house basically trashed. I spent the morning on a conference call with eBay and in writing my store newsletter, maintaining my Young Living page, reviewing tax preparations; nothing really special. A clean house will bring a little happiness into the day, I'm sure. To buy any of these Young Living products as a retail customer go to the web site and put in member/sponsor number 2256091 in the member sign-up box under "retail". To sign up for a wholesale membership (kind of like a holistic Sam's Club) go here and again put in member/sponsor number 2256091. You may also just contact me through the form on the side of your screen or through my Naturally Amanda Facebook page to order or sign up. This is a special and auspicious day. Good things are coming. You are loved and cherished, more than you probably realize, and you bring joy into at least one person's world. Repeat that hourly, diffuse the blend, apply the oil, and have a wonderful day and fantastic Valentine's weekend! Well, here's a little deja vu for you. We are in February and it's been so warm I got a sunburn standing in front of Walmart at my daughter's Girl Scout cookie booth and flowers are popping up all over. The sunburn was probably a result of the Slique Essence oil and Grapefruit essential oil I've been taking before meals. I've been losing weight and gaining energy like crazy, but I forgot citrus oils make you sensitive to sun. So, if you're on the Young Living weight loss trio or the Slique program don't forget to wear your sunscreen or cover up, even in February. Luckily, my anti-itch soothing salve knocked that sunburn right out. The recipe for that is here. Flowers are blooming in our yard. 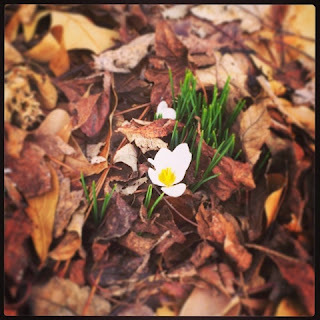 True to our usual pattern, even though the daffodils and crocuses are blooming and my blueberry bushes are covered in buds, we have an Arctic blast coming tomorrow with temperatures in the 20s forecast. So, I'm going to have to really fight to save the berry harvest. Last year this happened when our apples were blooming and even though I bagged the blooms and covered them with blankets we lost every apple. I am really beginning to wonder why I even bother with the garden! After the cold sweeps through I'm sure we will be right back to warm days, and that's when hay fever begins. Most of you longtime readers know, I am severely allergic to all kinds of things, everything they've ever tested in fact, and I have allergies year 'round. They do get worse in Spring and Fall, though. The only time I'm ever really free of them is when I'm right on the beach, where I am not lucky enough to live or even visit frequently. Last year, through a Herculean effort of changing my diet and lifestyle I managed to get off daily allergy medicine in favor of homeopathic pills I only take occasionally. 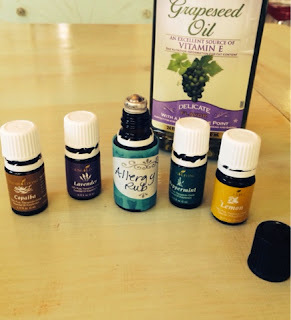 I do still have some issues, though, including a persistent cough, so I turned to the ladies in my online oils group and Pinterest to see if there's something I can add to my treatment. I found a roll-on and started on it today. I will let you know how it goes. And incidentally, don't forget, these posts are not meant to replace medical treatment and are not evaluated by the FDA. Recently the FDA sent letters to essential oils makers, including Young Living, as well as farmers' groups such as walnut growers warning them not to make health claims since the FDA hasn't checked those. It's so good to know the FDA allows cigarettes to be sold but wants to regulate WALNUTS. So anyway, use your brain, and if something is serious go to the doctor. Don't believe everything you read on the Internet. Recently I read a comment stating since Young Living oils are so pure someone allergic to lemons could use the lemon oil. Umm...NO! 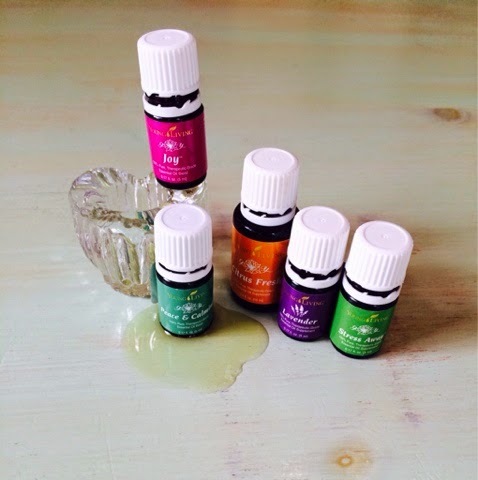 If anything, the essential oil is so concentrated it would probably cause a much worse reaction. So remember, any idiot can post stuff on Facebook and blogs (even me!). Educate yourself with books and articles written by real doctors and scientists. If you can find a holistic health practitioner or complementary physician they can help you work natural preventions and cures into your health care regimen. 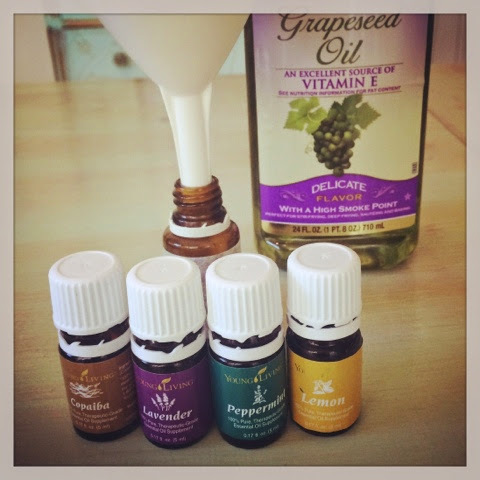 Add essential oils to a 15 ml bottle, top off with grapeseed oil, and place a roller ball fitment on the bottle. Shake to blend. Apply daily to the back of the neck, under the nose, to the soles of the feet, and on any rashes (don't apply to open sores). The lavender, peppermint, and lemon are referred to as the "allergy trio" in essential oils circles. I think they might as well be called the "everything trio" because it seems like they're in everything from cleaning recipes to cosmetic preparations. Copaiba is believed to be a powerful anti-inflammatory agent and also contains compounds that make things on the surface of your skin sink deeper into your pores, so it enhances the efficacy of other oils. The reason oil people are always advising you to put stuff on the soles of your feet is due to a belief in the practice of Reflexology, where each area of your foot is supposed to correspond to a part of your body or organ. I'm not sure whether I believe in that or not. I think it's good to put stuff on the soles of your feet before bed because that's the least likely place it will get rubbed off and can sit and soak in over several hours. But, I always keep in mind Eastern medicine is thousands of years older than Western medicine and is practiced by many millions more people to this day. We got some amazing herbal preparation in China that quickly healed our daughter's chest infection which Western antibiotics hadn't touched. This oil makes your skin cold and numb, due to the menthol in the peppermint oil, so it's great for itchy rashes from allergies. I swear, we go through peppermint oil like water around here! I use it for everything. I need to get someone to make me a still so I can distill my own! Even with my Young Living wholesale discount we are spending a ridiculous amount on peppermint oil. I will tell you what, this has been some day! I wish Young Living made wine. My daughter got off the school bus with a red swollen eye and I was really worried we'd sent her to school with pink eye. My son has gotten in trouble two days in a row at school, so I sent him to bed when they arrived. I called the doctor and was told at 3:30 to be in the office by 3:45. Naturally my son had just fallen asleep, so I had to roust him out of bed and floor it to the doctor's office with him still in his pajamas. It's a good thing I did; my daughter has a corneal abrasion, not pink eye. So then we sat around at the pharmacy waiting for her prescription. We hope a trip to the opthamologist won't be necessary but have to watch her until Friday to see. I'm going to be glad when this week is over! 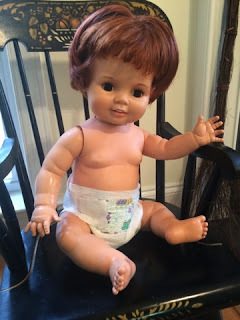 As I mentioned in my last post, I've been revisiting childhood the past few days working on a Baby Crissy doll. My sister had Baby Crissy and we played with her all the time. We had this same version. Amazingly, my sister's Crissy survived unscathed and with un-cut hair and is now owned by my niece. My sister sent a picture of Crissy wearing one of my baby nephew's diapers sitting in a chair in their family room the other day. This Baby Crissy was not so lucky. 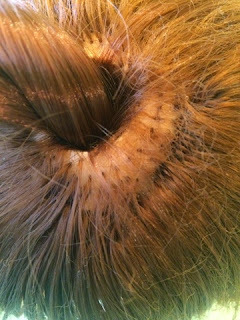 Her hair wasn't just cut; the entire ponytail was missing, along with the cord and pull ring. 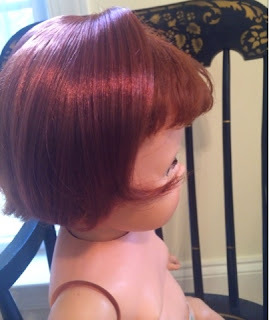 I replaced the ponytail and rooted in a little human hair for extra thickness around the crown of her head. You can find a tutorial showing how to replace Crissy's hair here. Crissy was a play doll as recently as the late 1990s, I guess, because she came wearing a real baby diaper I recognize as being a store brand worn by my own son. It made me nostalgic! I cleaned her inside and out, but there are a few play marks here and there I couldn't remove. The rubber bands which originally tensioned her arms and legs rotted and I removed them, so her limbs are a bit loose. She can still pose, however. 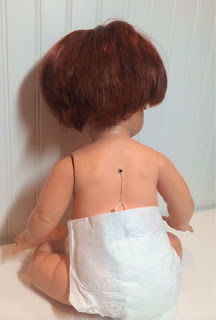 I only had giant curtain rings to replace the plastic pull ring on the cord, so I find the diaper useful for storing the ring when Crissy's hair is short. Crissy has some play marks I couldn't remove. 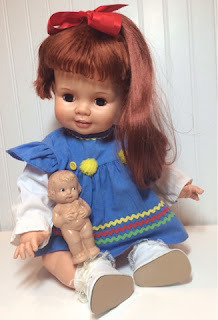 I dressed Crissy in real baby clothes that came in the same lot of dolls as she. I'm guessing they're from the 80s or maybe early 90s but I really don't know. They're a good fit, however, and cute on Crissy. 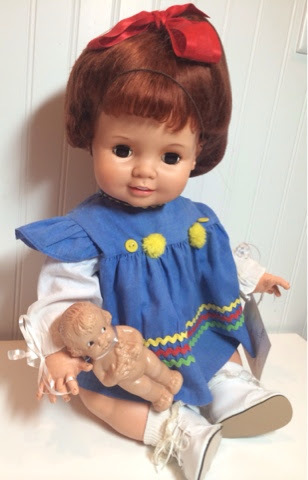 I gave Crissy a vintage squeaky rubber doll toy. Then I tagged her with my own tag and gave her a hair net, so she's all ready for a new mommy. You can find her, and many other dolls including a 1990s Ideal/Tyco growing hair Baby Crissy, in my store, Atelier Mandaline. A hair net keeps her style neat. Crissy is a life-sized 22 inches. Crissy with her hair worn short. Baby Crissy with new growing hair. When we were kids my sister had a Baby Crissy doll by Ideal. 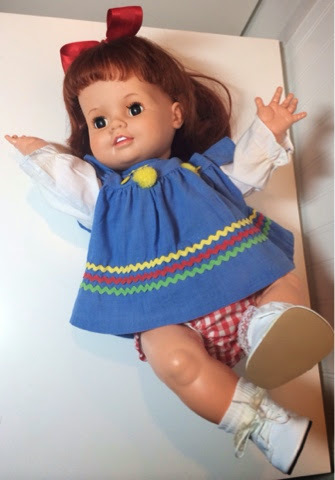 These dolls, part of the Crissy fashion doll family, were made starting in 1972 by Ideal. They continued production all the way into the 1990s, when they were made by Tyco. 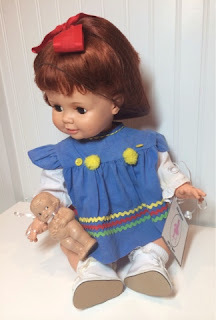 I actually have a 1990s Baby Crissy listed right now. 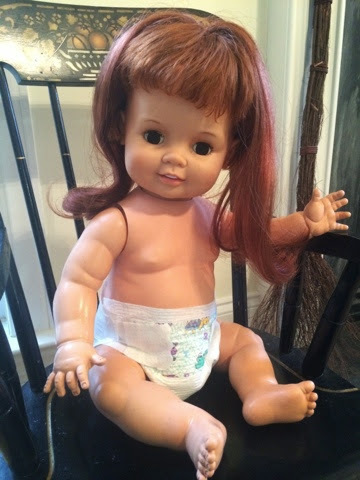 Baby Crissy dolls were advertised as having "growing" hair. They had a long pony tail you could pull out to make the hair "grow" and a string in back you pulled to shorten the hair again. 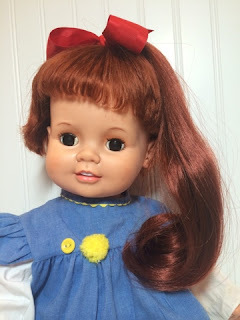 The trouble with this idea is that young girls, hearing the doll's hair would grow, would pull it put long and then cut it. 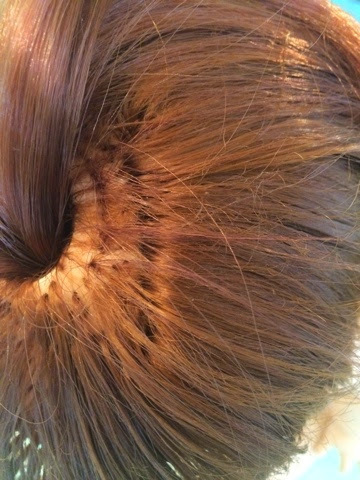 It's very common to find these with cut hair. Luckily, it's not too hard to replace the ponytail. I'll show you how here. 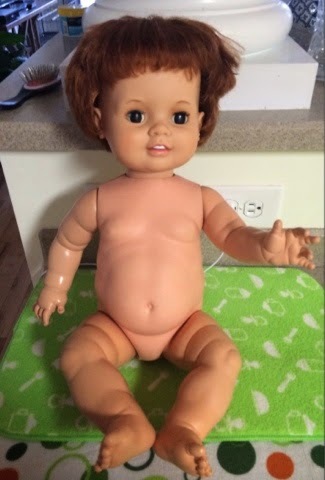 I got a Baby Crissy doll whose ponytail was missing recently and was about to sell her cheap for parts when I wondered if her ponytail could be replaced. A quick Internet search revealed you can replace the ponytail. 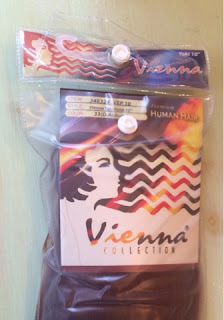 I searched my box of hair and found I had wefted human hair extensions that were a so-so match but not long enough. I found Prilly Charmin selling Diane Yaky Pony extensions on eBay and ordered a pack of two. The Yaky Pony red color #130 is a great match to the Baby Crissy hair and since they are already formed into a ponytail they're easier to use than wefted hair. I have one ponytail for sale in my store right now: Atelier Mandaline. Baby Crissy missing her ponytail. The cord goes in the hair slot. Once you've obtained your hair go ahead and see if you need to root any new hair or just replace the ponytail. My Crissy had her original hair and mostly just needed a ponytail. 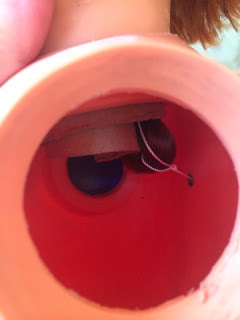 The top of Crissy's head has a hole mostly plugged by some kind of rubber or felt or something. I just used tweezers to push that down into the head so I could put the ponytail in the top of the head. Take this material out of the hole in the head. To get the the inside of the body I removed one of Crissy's arms. You can just pull these off. 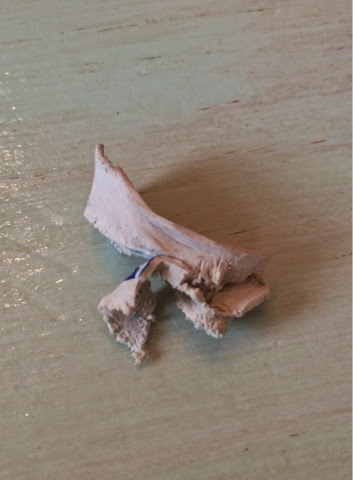 They were originally held tight with rubber bands around the flange on the top of the arm but these rubber bands are typically rotten so the arms are easy to remove. Drop a cord through the top of the head into the body. Find a good strong, thin cord, like kite string, and tie a weight to the end. I used a large-eye tapestry needle. Run the needle and cord through the hole in the head and down through the neck into the body. 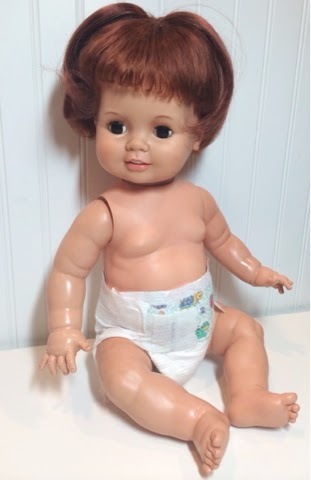 Baby Crissy dolls originally had a cardboard tube in their necks. This isn't necessary but will help with tension, so if it's still there leave it in. 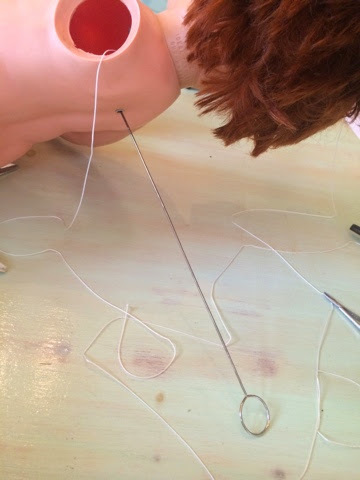 Once the cord is inside the body you will need a way to thread it through the hole in the doll's back. 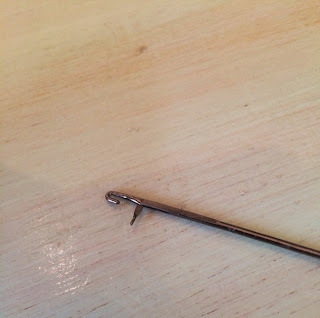 I used a tube-turning sewing implement, which is like a long narrow latch hook. I poked this into the back from the outside, grabbed the cord, and pulled it out through the back. 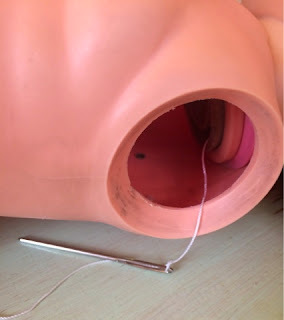 You could thread the cord on a short needle and push the cord through from the inside if you don't have a tool like mine. Pull the cord out through the back. 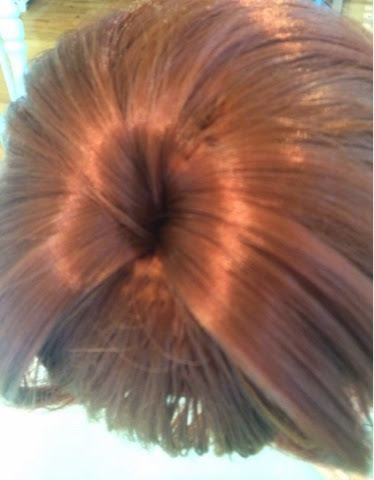 Once the end of the cord is pulled through the back you will need to attach the ponytail to the top of the cord. Tie the top of the cord through the top loop of the ponytail. If you're making a ponytail from loose hair you will need a length of hair about 30 inches long folded in half to make a loop at the top. Tie the hair to the top of the cord. 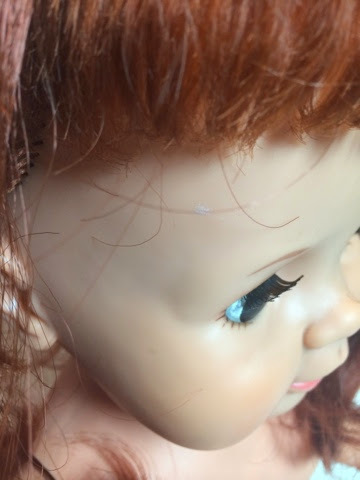 When you've securely tied the hair, pull the cord from the back of the doll, just as a child would have played with it, until the looped end of the ponytail is inside the doll's neck. Pull the hair down into the neck. Test the ponytail's "growing" action a few times by pulling the cord in back to shorten the hair and then pulling the ponytail out to grow the hair. Shorten and lengthen the hair to test it. When you've confirmed the hair works you can add a handle. Tie a marker on the cord to show how long the cord must be when the hair is long and short. If you don't have a long enough cord you won't be able to make the hair go as short or as long as it should. The marker will make sure you don't cut the cord too short when you attach a ring handle. Mark the length of the cord with some extra. When you're sure the cord is the proper length, find a ring you can use as a handle and tie it to the cord in back. I only had big curtain rings. I would have liked to use a smaller ring but not enough to drive around trying to shop for one! 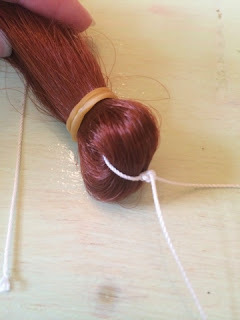 Tie the ring with a double or triple knot and then cut the excess cord. Tie a ring handle to the cord. When the hair is replaced you can put the arm back on by just popping the flange back into the arm hole. Pop the arm back on. 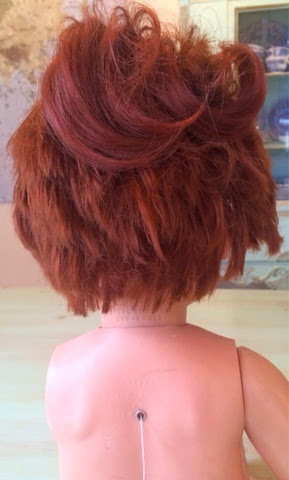 If your doll needs a re-root you can do that either before or after replacing the ponytail. I decided to fill the rooted hair in a bit around the hole in the head. The original hair was present but had gotten thin from years of play pulling the ponytail over it. I used wefted human hair extensions. 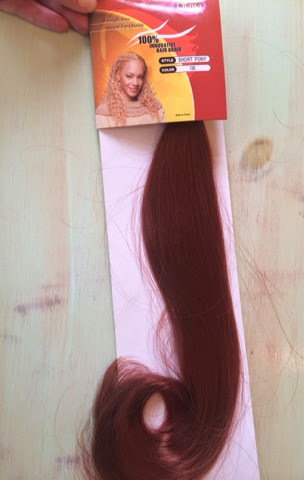 You could also use the second ponytail in the package for re-rooting if you buy a two pack. 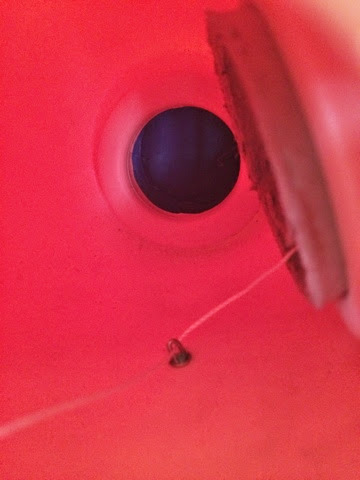 The hair had gotten thin around the hole. To root hair, first cut the weft off a small section of hair if your extension is wefted. 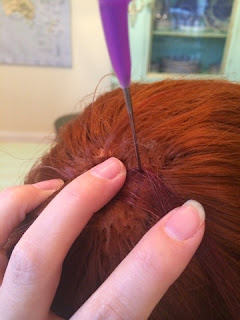 Lay the section of hair over the spot you want to root. Hold the hair taut over the section and push a felting needle over the hair and pull it out several times. 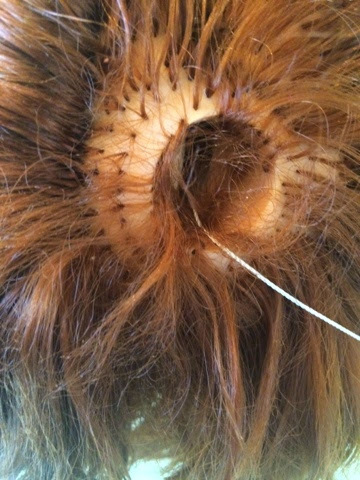 This pushes the hair into the hole and tangles it up inside the head so it won't pull out again. Place the hair and push a felting needle into it. Stretch the hair taut over the area you wish to root and repeatedly stab it with a felting needle. When you've re-rooted or replenished the hair to the extent you want, trim the new hair to match the original or cut it into the style you want if you're totally re-rooting it. The rooted hair helps fill in the thin spots. The new ponytail and rooted hair. 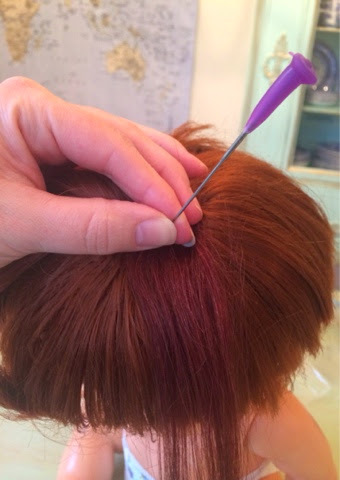 After you've replaced all the missing hair you can brush it gently with a wire bristle brush to style it. Try styling it long and short and blend the ponytail into the short hair when you pull the string out in back. Now your Baby Crissy is ready for play or display! The doll shown in this post will be for sale in my store soon so please check: http://stores.ebay.com/atelier-mandaline. The short ponytail makes a bob.